Melbourne Victory Women and I have had a couple of games since I last blogged, and after a hard fought battle and tough loss against the inform Canberra United, we bounced back with a strong performance against Adelaide United; winning 4-0. We had some great individual performances on the day with Caity Friend netting her first hat-trick for the club (and the first hat-trick in club history), Rebekah Stott solid in the back line as well as Steph Catley and Ashley Brown who were massive attacking threats combining well all game. I have to give a massive shout out to our hat trick hero Caity Friend, what a week she has had; turning 18, finishing her Year 12 exams and scoring her first hat trick wearing the blue and white… It must have been my amazing cooking at home leading into the weekend! Really happy for her and I’m sure we will be seeing more goals from the youngster. This weekend it is a huge game for the girls and I as we face reigning Champions Brisbane Roar. They also got a good result last week playing against Perth Glory so confidence from both teams will be flying high. Brisbane are a quality team and have some great individual players so I expect our game to be a thrilling encounter. We’re starting to gel as a team now and each performance is getting better and better. As always with a constantly improving team we still have a way to go and hopefully we can continue to build on each game and reach our full potential on the pitch. There are lots to look forward to for the remainder of the week; we have a Thanksgiving celebration this evening before leaving for Brisbane tomorrow. I never had the chance to go to Queensland last season due to the floods forcing our match in Brisbane to be moved back to Melbourne so I’m excited to see a new part of Australia this weekend! Until next time, thanks for reading and I hope to see you at our next game (come over and say hi after the match)! 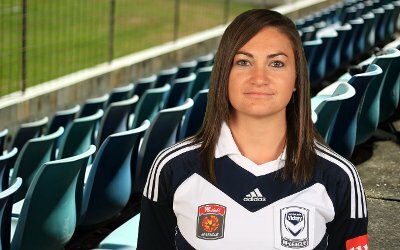 If you enjoyed Jodie’s article, click here to see all other Melbourne Victory Women player blogs. Catch the W-League every week at your local ground, or if you cant make the game see Match of the Round live on ABC1. Stay in touch with The Football Sack for the rest of Jodie Taylor’s Blogs!